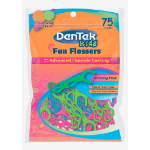 Makes Flossing Fun for Kids And Easy for Parents! Colorful crayon shapes kids recognize and love. Easy to hold in kid-size hands. Start healthy habits early for a lifetime of good oral health. A no-mess way for parents to help kids floss. Helps remove more plaque than brushing alone. Available in three fun designs and three fun colors. Appropriate for kids 3 years and up. The simple truth is that most of us forget to replace our toothbrush on a regular basis. Replace your toothbrush now at ToothbrushExpress.com.